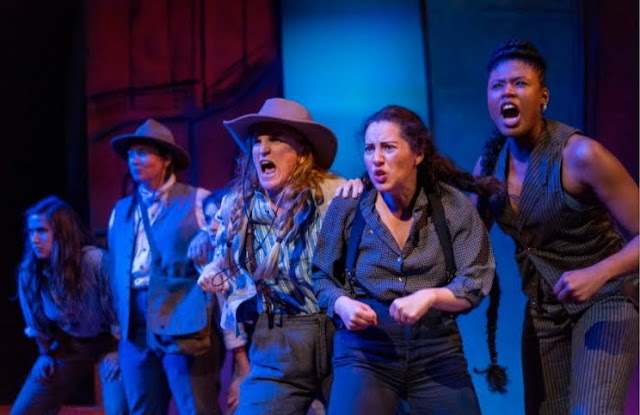 Carol's Theatre Reviews ~ It's Fun To Go Out: “Men On Boats” Beat The Odds In Rafting It Down The Colorado At NVA. “Men On Boats” Beat The Odds In Rafting It Down The Colorado At NVA. A friend of mine recently crossed off one of his ‘’Bucket List” things of ‘To Do” as a birthday present to himself. He took the plunge and went on a guided rafting trip down the Colorado River through the Grand Canyon. It was to say the least, somewhat of a luxury trip, as he described it to me. The convoy, headed by guides and raft crews went on variety of adventures along the way including evening meals provided by their guides. The guides prepared gourmet type meals eaten along rivers’ edge. The travelers slept outside under the stars. There were no worries about hunting for food or gathering wood for fires. Hiking and swimming were options with white water riverside attractions plentiful. Depending on the package and the number of days the trip lasted, additional side hikes to waterfalls, hidden grottos and American Indian ruins were options. And of course there were the rapids. Music and entertainment were an evening ritual and clean sleeping gear was provided. Suffice it to say it was a far cry from the Powell Expedition of 1869 when John Wesley Powel and his makeshift crew of nine white (men) mounted four 21 -foot long and four feet wide ‘round bottom’ Whitehall rowboats to explore the region of the Grand Canyon. Powell’s boat carried the name ‘Emma Dean” after his wife. Seven thousand pounds of food and supplies, enough to last ten months, was divided equally among three boats named ‘Kitty Clyde’s Sister’, ‘No Name’ and ‘Maid of the Canyon’. Though not the first to set foot in the basin, where the Green River merged to the Colorado River, from Wyoming to a Big Canyon on the governments first Sanctioned Expedition, Powell was the first commissioned to do so by the government. Very little of that region was officially mapped or explored and based on the extensive and expansive notes and map drawings of his survey of the 700 miles from beginning to end, that the group discovered, warts and all are now history. It would go down as the last great land exploration in the United States as “The Exploration of the Colorado River and its Canyons”. 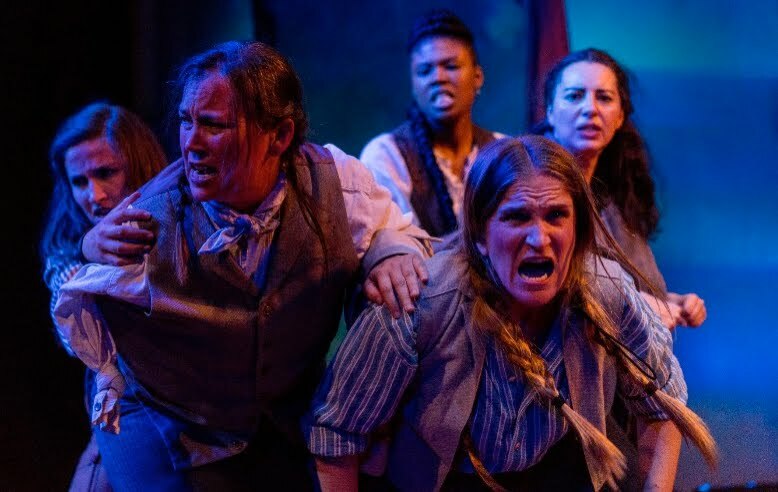 Playwright Jaclyn Backhaus “Men On Boats” making its regional premiere at New Village Arts Theatre in Carlsbad through April 22nd, has an all female cast as stipulated by the playwright. 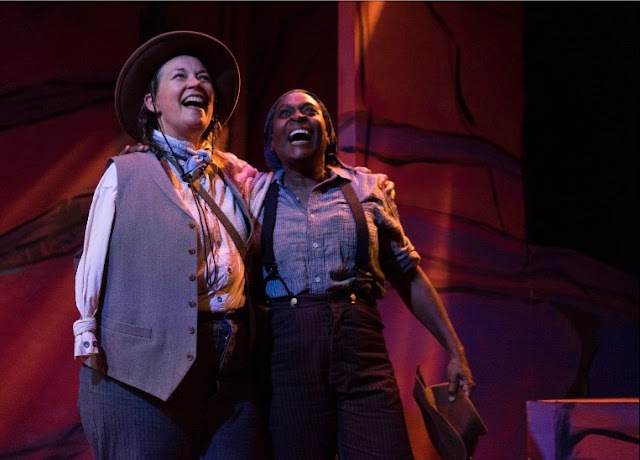 Powell’s notes and findings are the source materials for this play. All female cast of "Men on Boats"
Director Melissa Coleman-Reed not only goes along with Backhaus’ 2015 gender bending cast, it's racially diverse as well according to the playwright’s wishes. The fine tuned crew is well versed for their adventure. After we get to know these characters, it would be difficult to imagine men playing the same roles. Some of the trek makes for a white-knuckle running the rapids to capsized boats but in the long run, that adventure and the harmony/disharmony of those traveling took front and center including the obstacles they overcame. They did run out of food and three left almost causing a mutiny. Pretty much to a (wo)man they really did not know how much longer that had to go to complete their findings. 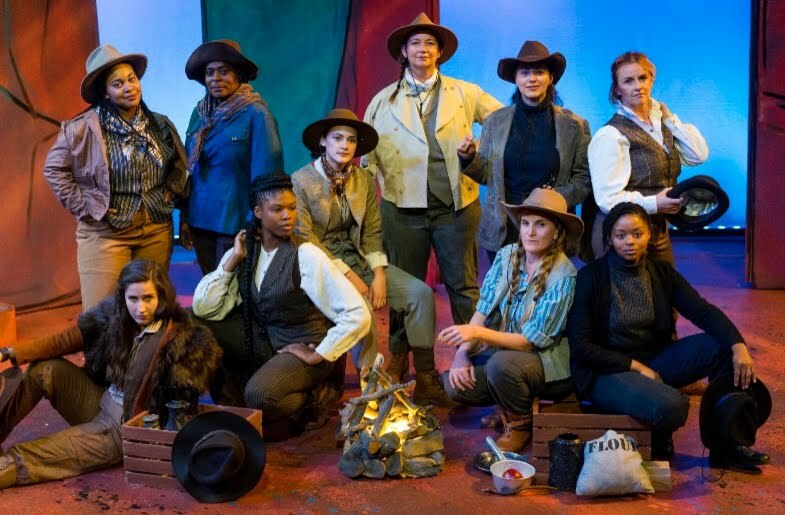 Paloma Dominguez Summer, a professional guide who felt he should have been the leader, to Joy Yvonne Jones’ Hall a professional mule driver and skilled oarsman, the diverse cast playes well off of one another. Old Shady (Milena (Sellers) Phillips) as Powell’s brother who sort of watched his back, puts in a very credible performance. Three of the men left the expedition days before it was completed and were never heard from again. But making do was the order of the day and Powell and crew made it happen. Reenacting an adventure such as this requires a vivid imagination and some pretty convincing acting since the only indication we in the audience had that we were in the Grand Canyon were moveable pillars painted in orange- brown with some black wiggles, a few promontories and cliffs to climb up on. (Christopher Scott Murillo) A blue background that would transform from flowing river to treacherous falls that Melanie Chang Cole’s projections and sound design, brought to life was most effective. Everyone’s job depended on the success of the others’ but few had skills related to the water. Most had land-lock experience. Only four got paid $25.00 a month and Hawkins’s pay was $1.50 a day for cooking. One distraction for yours truly was the high voltage energy (that shouted enthusiasm) almost throughout but came across rather as yelling and was uncomfortable for these ears. Also this storytelling and sprawling adventure could have been played out in 90 or so minutes sans intermission. Aside from that, the play and overall production shades comedy as the macho women dressed in Elisa Benzoni’s male rugged outfits and acted like their male counterparts might have except that most were petrified of those wiggle snakes they found and ate, by the way. They plunged into adventure seeking to make history, except history was already made. At the end of the day, Powell was the only one to go down in the history books, and of course having a man made lake named after him was the frosting on the cake. It's history (almost) in the making. But if you want to make your own history, try rafting it yourself. Where: 2787 State Street, Carlsbad Village, Carlsbad, CA.